"I'm a great believer in the importance of first impressions. 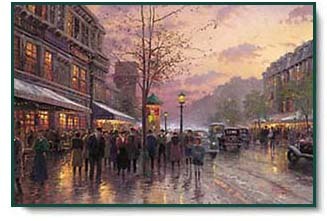 That's one reason why Boulevard Lights, Paris is so dear to me; it's the first print in my new City Impressions collection. The City of Lights has been a springboard to my imagination even before the first of my many visits there. You see, my mother had a print on her wall an energetic, dazzlingly lit Paris as seen by a 19th century street painter that captivated me as a child. So it seemed natural to launch my first Impressionistic series by honoring the art of such giants as Beraud, Cortes, Galien-LaLoue, with a celebration of the city that has inspired master artists of every era. I have enjoyed such a bustling vision of light and color in one of my journeys to Paris I just couldn't tell you exactly where or when. Because of this, Boulevard Lights, Paris exists for me in that ethereal world between experience and imagination that we call memory. And perhaps that is just as well. Because somewhere in the heart of everyone who daydreams is an imaginary memory of Paris." 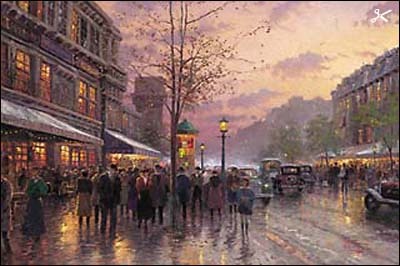 Boulevard Lights, Paris copyright © 1999 by Thomas Kinkade.